17 August. Fearing a power vacuum in northern Korea, the Japanese governor of Pyongyang turns to the Protestant church, the largest organized community in the north. He convinces the prominent nationalist activist and Presbyterian elder, Cho Mansik, to organize a committee to assume control and maintain stability. This committee affiliates with Yŏ Unhyŏng’s Committee for the Preparation of Korean Independence and helps with the formation of people’s committees in the region. 28 August. 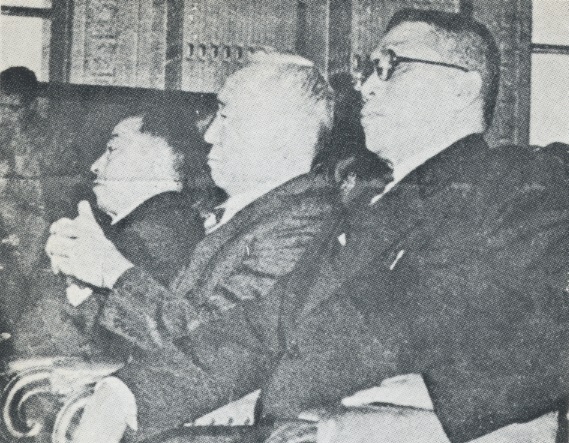 With 145 people’s committees now functioning around the country, the Committee for the Preparation of Korean Independence asserts that it now functions as the temporary national government of Korea. Some rightist nationalists disagree, however, insisting in the legitimacy of the Korean Provisional Government in Chungking. 6 September. Hearing that Korea is to be divided between Soviet and American occupation forces, CPKI leaders are faced with the impending arrival of U.S. troops in the south. They thus seek to strengthen their position by calling a national convention in Seoul. Here, in front of thousands of delegates, Yŏ Unhyŏng proclaims the Korean People’s Republic as the de facto government of the country. Although the cabinet that is appointed is dominated by leftists, it also includes rightists like Cho Mansik. Moreover, delegates elect the veteran nationalist Syngman Rhee, a rightist, as president without his knowledge or consent. Rhee later rejects the honour.